Choose from the wide range of Display Cabinets by Exclusive Furniture World. The Doral Oak Double Display Cabinet is made of oak and crafted in the traditional French style for .. 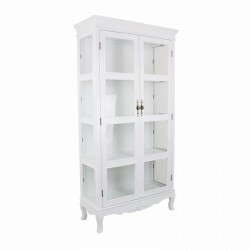 The Doral Oak High Corner Display Cabinet is made of oak and crafted in the traditional French style..
Dutch Merchant Cabinet WardrobeDimensions:H225 x W180.5 x 57 cmMaterial:White Cedar Wood (Mindi) Sto..
French Country White Display Cabinet Dimensions:H182.5 x W95 x 38 cmMaterial:Hardwood + MDFEAN:64901..
French style White Display Cabinet with Tempered Glass ShelfDimensions:H188 x W50.5 x 38.5 cmMateria.. This beautifully crafted piece of furniture is finished in semi- solid lacquered champagne frames wi.. The Jenison range is finished in solid oak with a semi-gloss lacquer seal. The rounded oak corners g..
Large Grey Dresser Display Cabinet Dimensions:H230 x W175 x D46 cmMaterial:Mahogany + MDFEAN:6490164.. The Orland corner display is finished in solid oak with oak veneers and features striking heavy roun.. The Orland double display cabinet is finished in solid oak with oak veneers and features striking he..